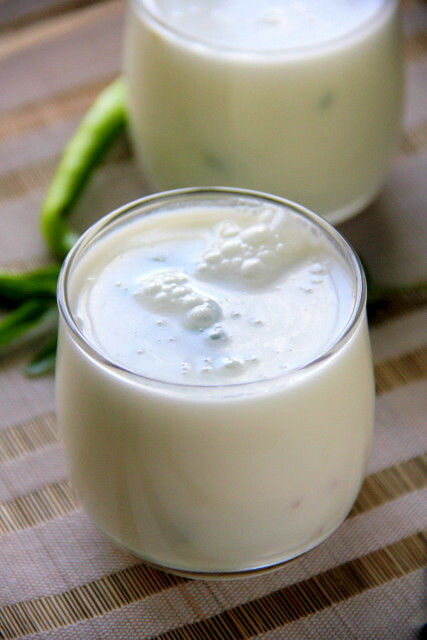 Spicy Chilly: Sambharam ~ Spiced and Flavoured Buttermilk to Beat the Heat! 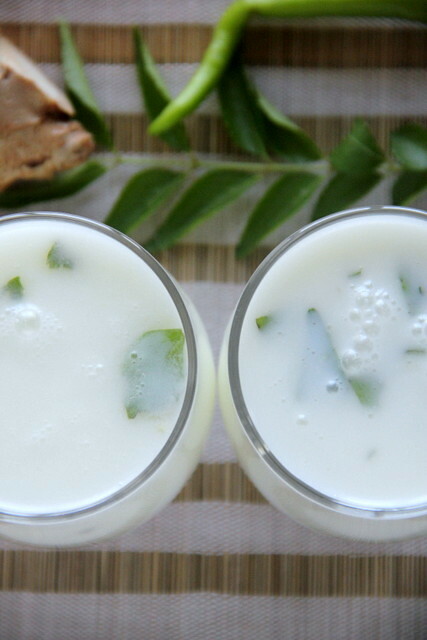 Sambharam ~ Spiced and Flavoured Buttermilk to Beat the Heat! 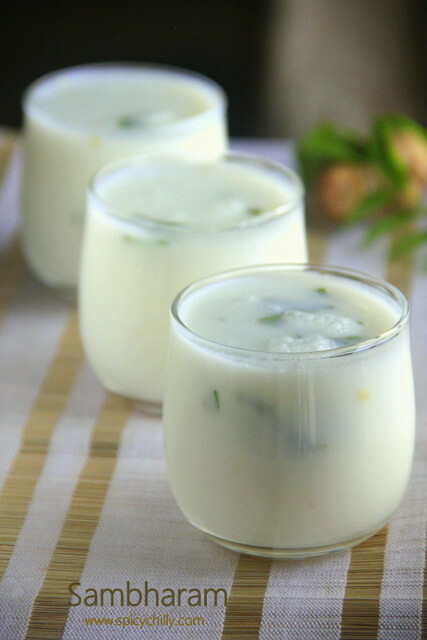 Sambharam or spiced and flavoured buttermilk of Kerala holds an important place in the culinary history which dates back to centuries. The drink is popular in other Indian states as Chaas, Majjige, Neer mor etc. The uniqueness of Sambharam, compared to the above counterparts is that it's flavoured with lime leaves or Narakathila, authentically! Now, what makes this an ideal summer drink? Buttermilk, being a natural body coolant, compensates the loss of electrolytes during the day, resulting in tiredness and dizziness. The best and natural way to retain body fluids is to drink tender coconut water or buttermilk with salt. This also compensates the loss of sodium chloride in the body through sweat. Primarily, this is way superior to bottled and artificially flavoured carbonated drinks! To begin with, wash the green chillies and lime leaves. Tear the leaves and crush them together with the slit chillies. I personally dislike biting into bits of chilly and opt this method to give the touch of heat to the drink. Lime leaves are crushed along with to impart the rejuvenating flavour. Top them with a cup of thick curd (I used home made) and whisk for a few seconds until creamy. Top it with 2.5- 3 parts of chilled water. Beat/whisk adding hing and salt. You may discard the lime leaves and chillies at this point. Add the minced ingredients; shallots, ginger and the herbs and mix gently to combine. Fill your glasses and enjoy the refreshing drink! If you use fat free free yogurt, use 2.5 parts of water instead of 3. Use home made, if possible, for best results. 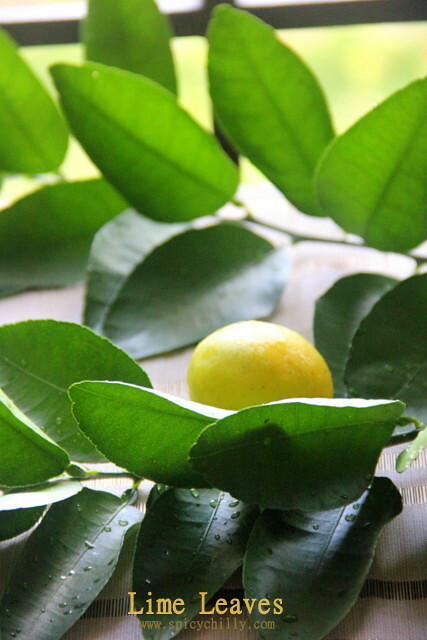 If you do not get hold of lime leaves, you can use any variety of citrus leaves as long as they are fresh. You can also substitute a tsp of lime juice if you don't get the leaves too! You can use a metal hand whisk or a beater, instead of the traditional wooden one I use, as well. I consider always cooking is also a great art. We need a creativity there to prepare new recipes. From your post I could meet those things. I hope if you have a good resume regards this will get a chance to do more in any reputed company as a master chef.